The exceptionally dry, hot weather we experienced in the summer of 2018 may seem a long time ago now, but there are still signs of its adverse affects on property. New figures have revealed a four-fold increase in the number of properties suffering from subsidence. Subsidence insurance claims made between July and September show that in excess of 10,000 households were adversely affected by the dry spell, at a cost of over £64 million. The Association of British Insurers said that, in a typical quarter, insurers would expect to deal with 2,500 subsidence claims worth around £14 million. The number of claims is the highest since records began over 25 years ago, beating the previous record breaking years of 2003 and 2006. The problems arising from subsidence can range from an unsightly diagonal cracks on house walls to more severe problems. In some cases, it may be necessary for people to leave their homes while repairs are carried out. If you spot any of the problems listed below, and cannot find a reason for them, get specialist help as soon as possible. If it is subsidence, the sooner it is diagnosed the better. A Chartered Surveyor will be able to confirm the presence of subsidence and its likely cause. You may be covered by your insurance for the cost of a professional investigation. Your Chartered Surveyor will deal with your insurance company and guide you through the claims process, as well as helping you to arrange any remedial work. • rippling wallpaper that isn’t caused by damp. If you spot any of these problems and can’t find a reason for them, ask for advice from a Chartered Surveyor as soon as possible. If it is subsidence, diagnosing the problem early can save you a lot of anxiety and money. It’s important to remember that subsidence can usually be rectified. Check whether your buildings insurance covers subsidence. Most insurers will aim to be as helpful as possible in dealing with any claim. They will recommend specialist advice. 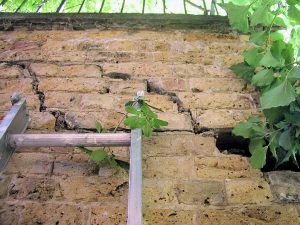 A Chartered Surveyor will be able to work out whether or not there is subsidence and establish the likely cause. Houses are built on clay soils and either the water table drops due to a long, dry spell or water is sucked out of the soil by trees and bushes. As the clay contracts it pulls the foundations, triggering deflection which may cause structural damage to buildings. Different types of clay shrink and swell at different rates. Water leaks into the soil from a broken drainpipe, for example, and washes soil away from the foundations. This type of subsidence usually happens to soils with a high sand or gravel content, and sometimes in chalk. How long will subsidence take to rectify? Establishing whether or not there is a problem can take a long time. There is rarely any cause for real concern unless cracks appear suddenly and are more than 3mm wide (the width of a 10 pence coin). In most cases the first sign of a problem is visible cracks in a particular area of the house and these may need to be measured and monitored, perhaps for as long as twelve months. Solving subsidence can be a lengthy process which can take up to two years. Underpinning the foundations usually prevents further movement. It’s a lengthy, costly and disruptive procedure that can cost anywhere between £5,000 and £50,000 or more. It is estimated that fewer than 10 per cent of properties suffering from subsidence need underpinning and the Institution of Structural Engineers recommends it is only used as a last resort. Tree roots Consumer organisation Which? estimates that about 70 per cent of all subsidence cases are due to tree roots sucking moisture out of the soil. Where this is the case, trees may be removed. It may be a quick and easy way to solve the problem. Be aware that removing a tree may actually add to the problem, but this is usually very rare. A Chartered Surveyor will be able to put you in touch with someone who can advise you on whether or not a tree should be removed or simply pruned to reduce the amount of moisture it takes out of the soil. Pipework Where the soil beneath the property is being washed away because of leaking drains or water mains, a less intrusive remedy might be possible. In most cases, repairs to leaky pipework will be enough to stabilise the property without underpinning. Your building insurance policy will usually cover the costs relating to subsidence, but check whether it covers all the costs of the investigation as well as repair. If the insurance company considers this reasonable, you will get your costs back. A policy excess will probably be specified in your insurance documents, in which case you will need to pay that amount before any further costs are covered by insurance. Your Chartered Surveyor will liaise with your insurance company and guide you through any claim you need to make. They can also help design and arrange for any work needed to fix the problem. As the world’s largest professional body for chartered surveyors, RICS (Royal Institution of Chartered Surveyors) offers clear, impartial expert advice on these issues. Chartered Surveyors cover all aspects of property, from conserving and restoring historic, residential, commercial, industrial and retail buildings to planning home extensions, home buyer surveys and valuations, dilapidations, boundary disputes, energy efficiency and party walls advice.